Sometimes a toilet upgrade can help you to save a bit of money on your water bill. This article explores the options available to you. A toilet is something that most people use without thinking. However, did you know that if you have an older toilet, you could be leaving money on the table? It’s true. 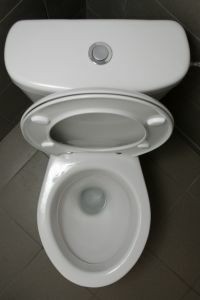 Some older toilets waste water at an alarming rate, particularly in the case of a run-on toilet, or a toilet that uses a lot of water per flush. If you want to upgrade your toilet, however, you want to make sure you find the balance between getting a toilet to save money and a toilet that works on a continual basis. A lot of newer toilets are low-flush. Some of the earlier model low-flush toilets actually wasted more water then saved it, as they required one to flush the toilet two or three times. Some newer low-flush toilets however, have the ability to use a small amount of water under very high pressure to work effectively. In fact pressure system toilets are becoming quite popular. Like everything, however, they also have pluses and minuses. The only real drawback that low-flush pressure toilets have is that they are often more expensive than regular toilets are, to the tune of $500+. However, with the amount of money that you’d save on your water bill would pay for the toilet in about two years, and they have the advantage of being extremely durable, lasting even a decade or more. In some cases, though, you may need to repair your toilet rather than replace it. Toilets require very little maintenance. They have very few moving parts, and only a few connectors. As a rule, usually the trap goes bad, or sometimes the floater. In some cases, like a clog, simply plunging the toilet is enough to clear the blockage. Other cases, however, you need to call someone in to help you with a clogged toilet repair.